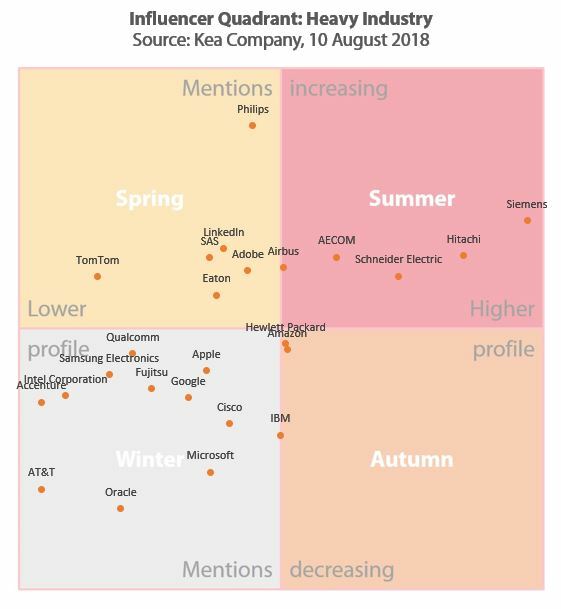 Siemens, Hitachi, Schneider Electric & AECOM are the firms to watch in Kea’s 2018 Heavy Industry Influencer Quadrant. Stephen Miller (@InfluenceRel) and Duncan Chapple (@DuncanChapple) published the report on August 10th to spotlight the firms with the highest profile in analyst research on chemicals, construction, energy, manufacturing, materials, resources, shipping and transportation. Philips, Adobe and Airbus also do well in the findings. Indeed, the general picture is that the transition of manufacturing firms into service providers is growing their share of voice at the expense of most of the mainstream IT powerhouses. The major vendors’ growing focus on top-tier analysts means they are losing share of voice in some ‘long tail’ research. It seems that trend is especially strong in heavy industry research. The Influencer Quadrant service shows the frequency with which hundreds of leading high tech and telecoms providers are mentioned in the research of around four hundred analyst firms. While the largest analyst firms naturally produce the most research, this methodology includes a large part of the long tail and freemium firms who are rising in influence. The TMT (Technology, Media and Telecoms) IQ is managed by Duncan Chapple. It covers research on computer networking; ecommerce; enterprise computing; hardware; ICT outsourcing; media; software and wireless solutions. The Heavy Industry IQ, led by Stephen Miller, spans chemicals, construction, energy, manufacturing, materials, resources, shipping and transportation. Life Sciences IQ. Emily Almond, our biosciences expert, leads the operations for our Life Sciences IQ, which covers Biotechnology, Diagnostics, Healthcare, Medical Devices and Pharmaceuticals. Join our webinars to find out more. Members of the Analyst Relations Value Forum on LinkedIn are invited to join for free: members can see their email for a discount code, or contact us.